A few months ago, I did a presentation to the MANTLE Teacher Librarians’ Conference in Newcastle about creating book trailers and digital stories. As part of the preparation, a series of space and science fiction related digital photos had been newly uploaded to Photo Peach (“Here’s one I prepared earlier…” again) and I was able to demonstrate how images could be easily moved, duplicated or deleted in the editing process. During the presentation, members of the audience suggested a few possible captions, in keeping with Book Week’s “Read Across the Universe” theme, and my intention was to get the Stage 3 students, back at school, to complete the brainstorming of the rest of the captions during Book Week. As the events of that week overwhelmed us, I filed away the groups’ A3 planning sheets, but dug them out again this week – and was thrilled with their results. A reminder to those on iPads: the latest version of Flash is required, so you’ll need to use a regular computer to see Photo Peach slideshows. And this just in: the Tuesday Library Book Club at Wyong High School was inspired by my presentation at MANTLE and spent some time with their teacher librarian, Ms Murray, making claymation figures to create an Animoto audiovisual to celebrate Book Week 2013 and its theme HERE. Wow! The Stage 3 students are deep into a Guided Inquiry unit on endangered animals. At this point, we haven’t zeroed in on exactly how the students will present their new information, but we are keen to make use of the elements of persuasion, and effective use of Web 2.0 online tools. 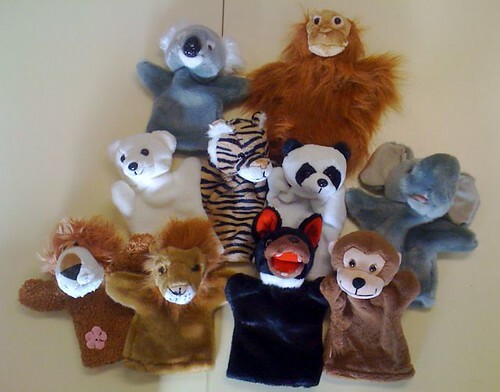 Over recent weeks, I’ve been noticing bargain stores with inexpensive, faux fur, glove puppets of a range of endangered animals, such as a koala, orangutan, polar bear, tiger, panda, elephant, two lions, a Tasmanian devil and a monkey. Each between $4 and $8. I’m fascinated how the puppets might end up getting used. 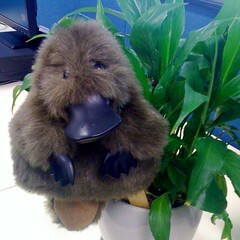 Above: Last-minute platypus! He was $16, but so cute I couldn’t resist. Happy 2011! Have I told you how easy Photo Peach can be? Yes, I have! It just took me all of ten minutes to upload these photos of our new BER school library being built, select music, edit captions and play it! All ready to share this free Web 2.0 resource with the students and staff tomorrow! Enjoy! Term 4 has seen about 200 class groups of Kindergarten and Stage 1 (Years 1 and 2) students, across NSW and beyond, participate in the Bear and Chook Books Rap. A book rap is a discussion between schools about a selected literary topic, conducted via a blog. This particular book rap focused on two picture books, Bear and Chook and Bear and Chook by the sea by Lisa Shanahan and Emma Quay, who contributed generously to the blog discussion as special guests. 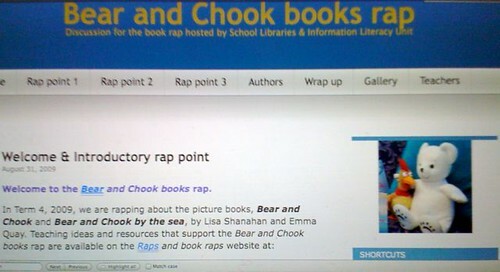 In NSW, book raps are hosted by the Department of Education and Training’s School Libraries and Information Literacy Unit, and are supported by online programming and teaching notes and a concurrent Teacher Rap. This rap also featured a streamed video of the creators reading Bear and Chook by the sea. Students, their teachers and teacher librarians, enjoyed exploring the relationship between the written and visual texts of these excellent picture books, and the theme of friendship. Groups of students created digital stories based on the main characters, and posed questions to the books’ creators. 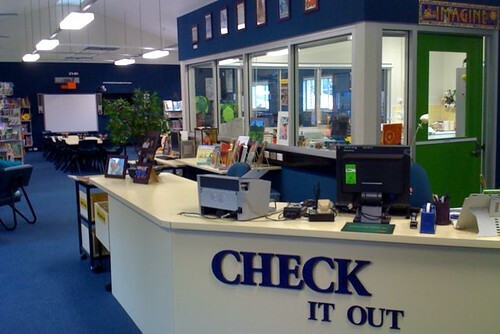 I loved reading Noel McDonough’s observations of a typical lunchtime in his secondary library, on the School Libraries & Information Literacy Unit‘s School Libraries 21C blog. It sounded very much like the scene in my primary school library on any day. I can’t imagine a day when school libraries have vanished completely. When he says “Although ‘libris’ means book – a book is just a piece of technology for the storage and retrieval of data from which we glean and construct knowledge”, Noel is exactly right. We can only guess what the next few years of advancements in mobile phones, iPods, interactive whiteboards (IWBs), and electronic paper, are going to bring us. Worryingly, I do see the gap between digital natives and some older digital immigrants getting wider and wider, and I’m so glad I keep being brave enough to explore some of what Web 2.0 has to offer, but knowing there’s so much more out there, and more to come. When I was editor of “Scan”, we made a point of asking, with every new article that was commissioned, how new technologies and changing pedagogy improved student outcomes. Applying that same question to my daily life as a teacher librarian has certainly helped me keep perspective on what new things I need to try out first, and to prioritise them. I also have come to believe that using Web 2.0 in my daily life, outside of the education workplace, is what has allowed me to build personal confidence to use new ICT tools with students. I look forward to the unfolding discussions. Web 2.0 – where to start? 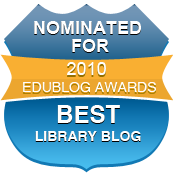 Today, a teacher-librarian colleague asked for what she called “an idiot’s guide” to getting started with a school library blog. It got me thinking back to where it all began for me. In 1996, just after getting my first home Internet connection, I was eager to start my own home page immediately, and I bought the book “Creating websites for dummies” – which warned that the biggest mistake new web composers made was not exploring what’s already out there, good and bad, before creating their own site. Nothing worse than a pretty web site that took many minutes for the graphics to upload. “For dummies…” recommended a good three months of ‘Net surfing first. Extrapolating that warning to Web 2.0, which was a whole new learning curve, I would encourage potential Web 2.0 educators to become a surfer and commenter on other people’s education blogs, wikis and library sites first – to satisfy themselves as to what works well, and what doesn’t work. Also, they can sample the list of blog links of their favourite library blogs. They’ll hopefully start to realise the strengths and weaknesses of various Web 2.0 software, the importance of currency/relevance of information, how well each web composer responds to their commenters, and so on. With Web 2.0, you can really only learn by doing. Try some links off this site’s blog roll, for example. Then, I suggested, make notes of what your dream school library blog might include. What pages can be static, and what parts could be regularly updated via a blog or wiki? Are you planning to permit indivisual responses (beware of cyber bullying, and who will “approve” messages), or will group-negotiated student responses be done in cooperative cohorts with teacher guidance? My colleague had asked for an “Idiot’s Guide” – I really like the commercial “For Dummies…” format myself, so if you feel you need such help after a few months of browsing/commenting, I’m sure there’s a great “Wikis and blogs for dummies” title out there. Also, most Web 2.0 sites have excellent user services attached to their pages. Edublogs has a bbs where questions, no matter how dumb, can be answerered by other users and Edublogs volunteers. As for wikis, “pbwiki” is now known as “PBworks”, and all old “pbwiki” URLs are automatically reverting to the new confiiguration for the moment. I have found “pbwiki” to be very easy to use, although the new upgrades have taken some getting used to. Our school’s two Kinder wiki projects are fully annotated – with attached pages of pre- and post-evaluations, student comments, teacher decision-making, etc. 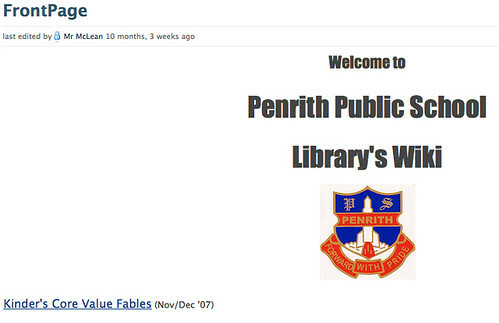 – so those pages might be useful for teachers wondering just how to take the plunge into Web 2.0. I also suggested trying the next rap (using blog format) from NSW DET. This strategy gives a fledging Web 2.0 educator a change to see a blog working that is fully integrated into a school or class program, addresses outcomes, and encourages cooperative learning and collaborative teaching. There’s always a “Teacher” section, where teachers and teacher-librarians can chat about their learning curve, and receive prompt advice re problems. The “Identity: sharing our stories” rap starts very soon, but there are also links to many completed raps and book raps on that menu page. “The K-12 Online Conference invites participation from educators around the world interested in innovative ways Web 2.0 tools and technologies can be used to improve learning. “This FREE conference is run by volunteers and open to everyone. The 2008 conference theme is Amplifying Possibilities. This year’s conference begins with a pre-conference keynote the week of October 13, 2008. The following two weeks, October 20-24 and October 27-31, forty presentations will be posted online to the conference blog for participants to download and view. Live Events in the form of three Fireside Chats and a culminating When Night Falls event will be announced. “Everyone is encouraged to participate in both live events during the conference as well as asynchronous conversations.